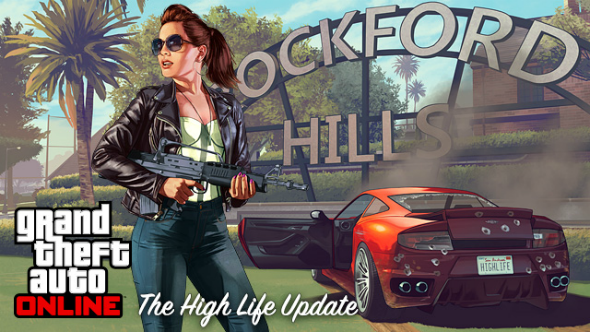 Today Rockstar company has released the latest GTA 5 update, titled High Life, which has brought a lot of interesting content into the game. So, let’s find out what the developers have prepared for us this time. Firstly, the fresh GTA 5 update gives the players an opportunity to have two properties, together with two garages, at one time. Now you’ve got more space to keep your favorite cars or motorcycles. Besides that, five new splendid apartments, which you can buy, have been added to the list of properties. Secondly, the new update includes four additional luxury vehicles: three cars (Enus Huntley S, Dewbauchee Massacro, Pegassi Zentorno) and one motorcycle - Dinka Trust. You can also purchase them at Legendary Motorsport. Moreover, this GTA 5 update has eight new Contact missions: GTA Today, Master Data, Crime Scenester, Artificial Scarcity, Handle with Care, On the List, Hit ‘Em Up, Denial of Service, - and four races: Stock Market Crash, Loss Leader, Home In The Hills, Thrusting Motion, - the detailed description of which the developers have promised to provide a little bit later. - ten additional vehicles from the Story Mode, which you can purchase online. So, what can you say about such a portion of the new content? Did you like the latest GTA 5 update? Share your answers in the comments below.